This entry was posted in Uncategorized and tagged education, Khan Academy, teaching. Bookmark the permalink. I believe that people need to learn how to perform a mathematical process (with understanding) before they can apply that process in a rich task like the ones you highlight in your post. If someone needs to learn a mathematical process, and the person is well motivated to do so, then Khan Academy can be a great tool. But that’s all it is. It is not a replacement for a rich mathematical education. Does Bill Gates really imagine that it is? I agree with this post. I think the author of the article was being a little hyperbolic in the comparisons that he made. For instance, the one with Kobe Bryant jumping over the pool with snakes could be analyzed to determine if there was any altering of the original (Kobe Bryant and The Pool with Snakes Scene)–this would require math, however, the comparison made was “math” vs. “logic/common sense.” Khan Academy teaches them the foundation that they will need to apply later on in life for their further mathematical education in High School, College, and beyond. I highly doubt Bill Gates believes Khan Academy is the only resource children will need in their life… Thus I agree that Khan Academy is simply a tool being added to an already existing (but not perfect) arsenal of tools. Robert Jones: Your viewpoint is a common one, one that has informed mathematics mis-education in this country for about a century. We’ve seen the poor results of that approach, and Bill Gates’ billions doesn’t make him some sort of educational wise man (apparently, in fact, quite the opposite). So I would suspect that he actually does believe that the ConJob Academy IS a rich mathematical education. And the Big Con himself appears to increasingly believe his own notices. It’s nauseating to see how the media kow-tow to this nonsense simply because of the Gates imprimatur. As for the notion that you have to know how to perform a mathematical process before you can approach rich tasks is counter to the historical development of mathematics and the way most people actually operate outside of school. In the real world, we encounter problems that intrigue or trouble us and we do whatever is necessary to find solutions. The motivation is intrinsic in ourselves and in our relation to the problem. Any resemblance between what Salman Con is pitching and real mathematics, science, thinking, problem-solving, etc., is purely coincidental. And the math and science he offers may very well be wrong as well, if repeated reports of inaccuracies are to be taken seriously. Why is this guy attracting so much attention and getting so much funding given how lame the product is (and I’m not talking about the cheap production values)? Have you looked at, say, James Tanton’s math videos on YouTube? @Michael Paul Goldberg: Did Salman Khan run over your puppy with his car or something? Your answer speaks more to your disdain for Bill Gates and Salman Khan than it does to the problems with the US education system. “Repeated reports of inaccuracies”? source please? What’s your point other than spitting venom? Agreed.Isn’t it ironic that this blogger uses a video on “independent” learning to support his claims when the whole basis of Khan Academy is Independent learning? Obviously Khan Academy is meant as supplemental to more traditional schooling approaches. After all, he started this video series as a tutorial on top of school material for his cousins. Would this blogger also be willing to malign all tutors as evil-doers trying to misguide eager bright students? Please, dear blogger, apply some of the logic that you expound on in your blog post. Wisely, however, you note that we have to “change the game.” Why can’t khan academy be part of that change? Perhaps you were hyperbolic in this post on purpose to get replies and notoriety? If so, I guess I’m a sucker for it. I think Kahn Academy is a good resource for helping students who need some support and extra help. I don’t think it is a substitute for a teacher, like some people are saying. A teacher can show students how to solve the problems that Kahn Academy could, but would also apply those problems and concepts to a bigger idea, which would give the students what they need to solve the open ended problems posed above. It is just a tool. Period. It is a not a game changer. The thing that Salman Khan said during his TED talk was that he saw his videos as part of a larger curriculum. I agree with that thought 100%. I don’t want to reduce math to simply cranking out numbers, but building computational proficiency has to be part of a balanced curriculum. Khan Academy is good at that one part of teaching mathematics. There is no question that education needs reform. I like the forward thinking of Khan and Charter schools all over America. Is this the solution…no! This is like you said, a player in the game. The fact that he was able to tutor his cousin I believe over the internet with a series of videos shows the power of integrating technology into our mainstreem and public classrooms. I have taken many online courses and they all lack social presence. The ability to communicate face-to-face with people is still an important skill and learning tool. Thank you for the post. I agree with Chris. Perhaps Khan’s stuff could be used in a more flipped classroom idea. Class time is spent working on real problems like are suggested above, Khan is used as a resource for computation help. In response to Robert’s response (specifically: “people need to learn how to perform a mathematical process”) I have a few points to bring up. 1. Many, many mathematics classroom spend all of their time learning the tools without actually every using them to solve rich problems. This is a flaw of curriculum which emphasizes the tools and not the richness of real world applications of the mathematical tools the kids learn. 2. Much of the mathematics that is currently taught in schools has basically NO real life application. So essentially we are teaching tools which have no use except as prerequisites for other tools (which often have no use in themselves either). 3. There are a wide variety of tools you can use in a very rich way in the real world without completely understanding how they work. In my mind, more important than understanding how something works is understanding how it is useful and where it is useful, and when. You use a word processor, but only a very small percentage of people understand how the word processor actually works. As for your points about the Khan Academy not being a replacement for a rich mathematics education, I completely agree. It is a useful tool for understanding a particular kind of calculation, but I would argue that we need to spend less time learning about how mathematical tools work, and more time spent learning how to apply them. What Scott said. KA can help build and/or reinforce computation and reasoning skills, freeing up the teacher to provide richer, open ended real world problems. Khan is about mathematical procedures, processes, and algorithms…not understanding mathematical concepts. Robert, David A., Chris, Scott, and Ed: I agree with you. But like David Wees said, richer curriculum is NOT happening in many classrooms. Khan and Gates are not talking about what students and teachers are doing beyond Khan Academy. The news stories are not showing the open-ended problems the kids should be engaging with after mastering the basics — instead they show kids sitting in front of laptops working drills and watching videos. The focus is on the wrong things — hence my statement that education needs changing because we are valuing the wrong things. Khan Academy is an excellent solution to the entirely wrong problem. Why isn’t anyone (besides Dan Meyer) talking about rich math and science education? Dan Meyer’s TEDx talk, which was posted to YouTube 11 months ago, has about 10,000 FEWER views than Sal Khan’s TED talk, which was posted to YouTube 3 WEEKS ago. That’s the problem! If Khan is to be part of a larger curriculum, we need to discuss and build that curriculum, because it isn’t going to build itself. Khan Academy and its predecessors (Academy 123, BrainPop, GetAheadMath etc) are not the silver bullets that some hope. By now we know there are no silver bullets in education. But Khan can be a useful tool that many teachers can take advantage of in a variety of different ways. We forget that many new primary teachers have little confidence with math content and would be delighted to incorporated these videos as part of their math program. Khan is still focused on computation, done so well by computers, so KA fails to focus math activity on problem solving and modelling. Worse, it reduces learning math to a series of lessons on how to calculate, a program reminicent of the failed attempt by Russell and Whitehead in Principia Mathematica. Finally, KA is teacher-centred so fails in not allowing students to learn through authentic problems, inquiry, and open-ended investigation. Nice flip though, if you like that kind of teaching. The last clip about “The Independent Project” is an inspiring success story, but I kept asking myself, what happens when a program like this is expanded to 20, 50, 500 students? Is there a student body scale or carrying capacity that limits success? I think organizations like the Khan Academy that deliver content in new and technologically creative ways provide access to information that many learns would otherwise not be able to access in traditional class settings, but I agree whole heartedly with Frank that receiving content is not the sole purpose of education. I attempt to individualize student learning as much as possible with inquiring based lessons and project based assessments, but often struggle to see true understanding in my larger classes (42 students/period). Which is why I wonder if an authentic learning environment needs to answer the question, does size matter? Oh no, the penguins on a sled are back! Sometimes there is a clip on KA that can help a student’s particular problem. Often, however, he glosses over the areas of difficulty actual students have. So it’s another “roll the dice” mechanism, maybe you find help, maybe you don’t. Of course, Bill Gates likes it. It feeds his need to bash teachers and public education without helping either one. Experienced teachers know it isn’t always possible to anticipate the problems students will encounter, and getting at the specific difficulty takes time, patience, and good communication. Not possible in KA’s format, and Bill Gates has no chance of getting that, yet he gets a national media platform on which to offer his opinion, his ignorance about what teaching really involves notwithstanding. I think just about anything is an improvement over what is considered to be a traditional math class. Certainly, Kahn’s extra skills and drills would certainly have helped me to get better grades on high school math tests, but what would have inspired me to want to build the skill set necessary to solve the “real world” problems cited in this article? What would have lit a mathematical fire under me? Something or somebody would have to convince me that I a) had some ability in the area of mathematics b) had a future in some sort of math-related career that I could envision c) could have some fun and be successful with it. Those points tend to fall well below the radar when we talk about what math education should be like. Let’s get all the information first, people! I got into teaching high school math 4 years ago. When I started the job, I thought I knew exactly how to make math more interesting and enjoyable for students. I didn’t give them practice questions because I didn’t want to drill and kill – I did not want to bore my students with computation. I spent my time emphasizing hands-on experiences, learning from each other, going on hikes where we could complete amazing race challenges, taking photographs and discussing symmetry, using all of our tools and asking open questions. Students started to really enjoy my class, and really started to enjoy what they were doing. In a grade 12 university preparation statistics class, we were going online and finding car insurance quotes and trying to estimate how a different car or a different age etc. would affect one’s insurance premiums. My students were hooked on the activity. They wanted to learn more about this, they’d make comments about how it was unfair that a married female would pay significantly less than a single male. They were able to have a great conversation about the math…. but they were also extremely frustrated because they could not describe the relationships – they didn’t have the language. My grade 12 students were struggling heavily with finding percentages and using simple fractions. It became difficult to discuss deep and interesting mathematical concepts about personal bias and statistical significance when students thought that 1.1 x 10^-15 was a larger probability than 0.01, simply because they did not understand scientific notation. Of course I would help guide their discussions and help them through these conceptions, but these are not isolated incidents – huge gaps would appear almost every day with nearly half of my class. They had difficulty adding decimals. They could instinctively tell me that if the probability of success was 20% that the probability of failure was 80%…. but they were lost when the problem had a 3/17 probability of success due to their fear of fractions. These problems are what the Khan Academy can address. It allows teachers to explore truly meaningful mathematics in the classroom because students have an amazing, fun and motivational tool to help them learn the basic language of mathematics at their own pace. I want my students to love math the way I love it – to see the beauty of the subject, to see the deep philosophical questions raised by a set of logical axioms taken to the nth degree… But they cannot get there until they have the necessary skills, and I think that the Khan Academy is one of the best tools that can help us all have these conversations with our students. ps – as an aside, one of my grade 10 students was watching a video on Khan Academy on integer addition, and Sal mentioned a trick to determine if a number is divisible by 3. She was frustrated because he never explained why. When a student who has failed a course three times starts asking the question why something works, then you know they are hooked. I don’t care if it’s watching Dan Meyer fill up a bucket with water, or watching Sal Khan show a mechanical process for how to use a number line – if it sparks a student’s curiosity and gets them interested, then the tool has one it’s job. I have to say that Khan has become a little overawed by his on marketing furb and having been giving the telephone number for Microsoft’s HQ. His basic understanding of the education marketing and the use of new technology is flawed, He put his videos up for people to access on YouTube when over 50% of schools will not allow access to YouTube. Not very helpful to say the least. He has also made a lot of noise about fre access to his videos. Bottom line is that what he has produced is there because of hand-outs from Google and Gates and others and still it offers no tech suppot. I have to wonder how he plans to provide any degree of support when the money runs out. Time will tell. As far as reinventing education – that is rather an insult to teachers. A chap sits at home for a couple of months with a blackboard and a home movie camera and claims to reinvent education ????? In my humble opinion, the two class of problems illustrated by you are not much different. The difference is that the second set (which Khan’s videos cannot help solve) are one level above the others. They are real life problems. Of course real life problems cannot be solve using mathematical equations and I totally agree with you. But here Khan is taking up first steps. In our current education system, he is trying to bring a workaround to help our students better. Students are finding it easy to learn. I also think one day he will bring out videos which would help in solving problems like what you are bringing up. Great post anyways. KA is an indictment of education? The love of KA shows failure of education? You can’t be serious? I hope this is an April Fool’s joke. First, KA is a “supplement” to a student’s education, not its “replacement.” If you can’t parse the difference between the two, then that clearly shows a failure of YOUR education. Second, KA embodies more than just Khan’s lectures. It’s also encompasses the interactive problem sets backed by real-time analytics, as well as the potential for true peer-to-peer interactions (an encouragement for students to not only learn, but also to teach). Third, KA is currently an infant in terms of technological and educational potential. The failure to realize how KA could eventually help students develop the capacity for higher order thinking (i.e., the ability to synthesize and utilize information, however abstract or dense) is comedic. A chap who sits for a couple of months with a blackboard? Are you f*cking serious????? This “chap” happens to educate millions–many who don’t have the luxury to learn properly. This “chap” could’ve easily spent those “months” doing something far less valuable for society…but instead, actually decided to help educate the world. Maybe you try emulating him. I’ll say it again: Khan and Gates are not talking about what students and teachers are doing beyond Khan Academy. The news stories are not showing the open-ended problems the kids should be engaging with after mastering the basics — instead they show kids sitting in front of laptops working drills and watching videos. The focus is on the wrong things — hence my statement that education needs changing because we are valuing the wrong things. Khan Academy is an excellent solution to the entirely wrong problem. However, in these times of increased standardiz­ed testing and shifts toward teacher pay based on test scores, it’s not hard to see KA being misused as the majority of math or science instruction, especially at the lower grades where some teachers are less comfortable with these topics. If Sal Khan wants his videos and software to be used alongside teachers as a vehicle to enriched math and science exploratio­ns, I think he has an obligation to make sure of that and to show everyone how students are going beyond KA. So far, it just been lip service with no evidence or actual examples. True peer-to-peer interactions do not need video lectures. Here’s a short video of one teacher doing just that, without using textbooks, lectures, or videos: http://bit­.ly/Modeli­ngPhysics Please watch the video and look at the peer-to-peer interactions. I bet the P2P interaction using Modeling is even richer than P2P after a KA video lesson. 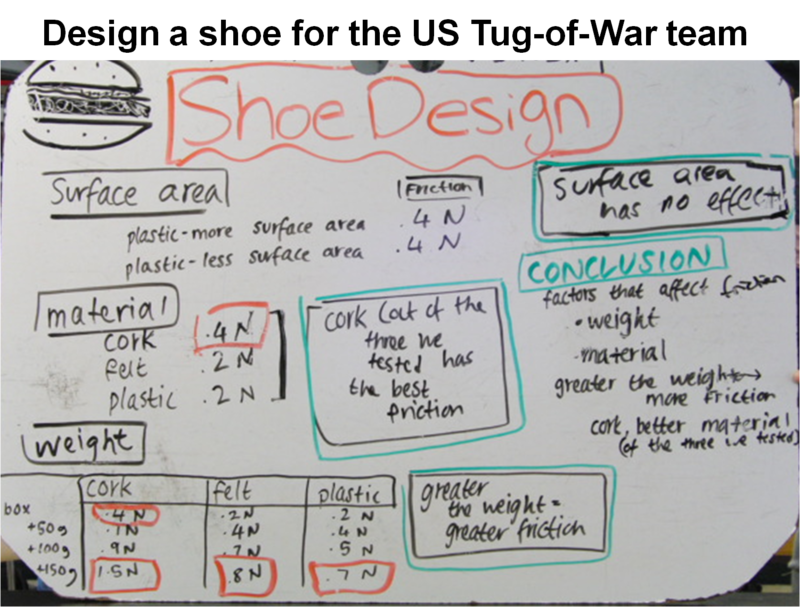 In Modeling, students are actively helping each other create their own knowledge. In KA, students are trying to help each other digest someone else’s knowledge. Also, the problem sets are hardly interactive. KA should look into ANDES, the history of PLATO, and these Multimedia Pre-Lectures if KA wants to grow out of their infancy as electronic worksheets. These have all been developed, researched, and tested. I often wonder how much background the KA team has in understanding how people learn math and science. And the badge system needs to be eliminated, as Dan Pink or Alfie Kohn would argue. At the pilot school’s blog, you can read about the detrimental effect KA’s badges are having. Students have eschewed real learning and are going soley for badge attainment. What happened to learning for the enjoyment of learning? If the material is presented in a truly engaging way, badges and rewards are unnecessary. Please check out these other three articles: Khan Academy and the Mythical Math Cure, Khan Academy – Algorithms and Autonomy and “Don’t we need balance?” and other questions about Khan Academy. They do a great job of summarizing my thinking. That discussion is happening. Why do you think he was introduced to speak at TED in the first place if not to help foster such a discussion? The exchange of ideas never happens in a vacuum. Khan and Gates are not talking about what students and teachers are doing beyond Khan Academy. Not true at all. Did you even watch his TED talk? In it as well as this speech, he mentions the role of KA in terms of what students and teachers do beyond it. He’s keen on moving the discussion from student-to-teacher ratio to teacher’s time-to-student ratio instead. He’s thinking in terms of scale, and yes, the KA model that’s constantly being built is scalable. The news stories are not showing the open-ended problems the kids should be engaging with after mastering the basics — instead they show kids sitting in front of laptops working drills and watching videos. The problem is most kids haven’t even mastered the core concepts. With a lack of such mastery, solving open-ended problems becomes dubious at best. As for showing kids sitting in front of laptops doing drills and watching videos, that’s called “B-roll footage” in filming parlance. It’s obviously only a part of the overall picture that makes up a student’s day. I think he has an obligation to make sure of that and to show everyone how students are going beyond KA. So far, it just been lip service with no evidence or actual examples. Like I said, KA is still in its infancy. And even then, he has the case study regarding the Los Altos school district, which is evidence of how effective KA has been. True peer-to-peer interactions do not need video lectures. What are you talking about? P2P interactions has nothing to do with video lectures. It’s a third part of KA’s overall model. One: lecture, Two: problem-sets, Three: Peer-to-Peer interactions. And yes, the Modeling paradigm can easily be adjusted to fit the KA infrastructure. I believe hands-on learning with real-world applications is the best (most natural) way of learning. But that’s not to deny that KA (or its variation) can’t have that introduced into their system. In other words, they aren’t mutually exclusive. To characterize the two as an either-or option is absurd. I often wonder how much background the KA team has in understanding how people learn math and science. I agree with you. The concept of badges and leaderboards seems to detract the student from the real reason they should be learning. In my opinion, it’s a distracting gimmick. Thanks, Lance, for your detailed reply. Do you know any specifics? I guess my problem was when Khan said in his talk, “They took a fundamentally dehumanizing experience — 30 kids with their fingers on their lips, not allowed to interact with each other. A teacher, no matter how good, has to give this one size fits all lecture to 30 students — blank faces, slightly antagonistic — and now it’s a human experience. Now they’re actually interacting with each other. ” He makes it sound like that either doesn’t happen at all in a regular classroom or it can’t happen without flipping the classroom. So I just wanted to show that there are teachers who have been doing this all along in math and science (though not the majority of us, I assume). He also talks about mastery learning, and everyone being an A student. I use standards-based grading to address that with my students (as do many of my fellow bloggers and tweeters). Click “Standards-Based Grading” in my header menu to see examples from my classroom. And look at any of the “SBG Blogs” in my sidebar. Do you know what they are doing for the other half? Also, his own videos are “one-size fits all.” As I stated in a previous comment, I can’t use any of his videos with my physics students, because they are not at the right level or they don’t use the same representations. Yesterday I was looking for Khan videos about Newton’s Second Law in an elevator — a classic example. He didn’t have one. He had a simple F=ma video. He also had a more complex video with two blocks, an incline, and a pulley. So I was out of luck. Regarding feedback from teachers and students: does that apply to possibly reworking videos also, or just to the web-based exercise system? People hear this Khan guy is changing math. They check out his video—this looks cool. Profiles can show exactly what kids are learning, and students can hear over and over just how to complete the square, or how integrate trig functions. Teachers find the kids really seem to be learning these skills, and when teachers give them their tests (which are never much more than exercises in skill testing anyway, so they basically look like the 11th exercise in Khan), and then teachers think “WOW–this really helps the kids to do better on my tests—this is great.” And so the public, the media, students, parents, teachers, and administrators are sold. Of course, most people have never seen Dan Meyer’s TED talk, and most people have never really thought that there was anything more to math than climbing the rungs on the ladder, because that’s all they ever did in school. So it seems to me than there are only a tiny handful of folks out there who are both good at math AND understand what math could really be. This tiny handful actually gets why Khan isn’t good. And given how slow the world seems to be in picking up on the initatives of Dan Meyer and the rest of the math teachers in the blog-o-sphere, I wonder if this can ever change. I loved Dan Meyer’s talk. I remember watching it several months ago thinking how wonderful it would be to see his methods of creating word problems introduced as a standard. With the help of interactive and dynamic web applications, I can see it becoming a norm, replacing the obsolete technology known as a textbook. I could also see how such problem sets could be introduced into the KA eco-system. And if not KA, I guarantee there will be an environment where such problem sets will live in in the near future. If a student came to you and said she’s been using Khan’s vids, and they help, what would be your reaction? I’d really love to see Khan work with about 20 kids in a classroom. It’s a different world. If she knew she was struggling, and found a Khan video that helped her, I would give her a high-five because she’s becoming a more independent learner. I’ll be honest: I’ve actually tried finding KA videos for my students to use as references for studying, or to use as a tutorial when there’s a substitute teacher. However, I teach physics from the Modeling paradigm, and so I haven’t found one good one. They either tackle problems that are too hard (AP Physics level) or they don’t use a lot of the multiple representations that are so fundamental to my teaching (kinematic graphs, interaction diagram, energy pie graphs, momentum bar charts, color-coded circuit diagrams showing pressure and flow, etc.) that the videos are useless to me. His videos do not align with proper Physics Education Research pedagogy. I’ve been a bit swamped lately so I’m behind on my reading on the fairly recent Khan/Gates hubbub. I’ll offer a more synthesized, thoughtful response at some point in the hopefully near future. Right now, though, this is how I feel. Hey Frank, Can you share a photo or send me a link to where I can see a “color-coded” circuit diagram? Cool. Thanks. At quick glance, I like how this curriculum looks. A lot of circuits is taught largely as a series of constraints — junction and loop rules. Or just patterns drawn from empirical observations with little explanation about how or why. This seems to incorporate a better sense of mechanism for how things work. Khan Academy provides tools for particular tasks. As you point out with many examples, these tools don’t work on all tasks. It does not make tools useless overall. There is a need for an ecosystem of different tools and communities for mathematics education. I doubt any one community (or person, in Khan’s case, originally) can build all tools for all needs. You’re right. I not upset with the Khan Academy videos, or Sal Khan. I more irritated by the media and big money/big influence types who view it as a silver bullet. Even Sal Khan recognizes that it needs to be part of a bigger curriculum, but I don’t think many people get that. Many people, which unfortunately includes media and business broadcasters, don’t have good understanding of educational entities. For example, Khan’s collection is not a curriculum; even the gamified exercise collection that now comes with it is not a curriculum. But do people know this? For many, any well-organized collection of math “things” (problems, videos, standards, games) equals a learning program. NCTM standards and such have been out for decades and people still don’t know that standards do not constitute a curriculum. I imagine the Khan Academy would stimulate reflection for those who stand at the front of the classroom doing equations on a chalkboard. In that way, it is an indictment of education. Khan has removed the need for this activity. Now what? But should we replace lectures at the chalkboard with lectures on video? Or should we get rid of ALL lectures? When students create their own knowledge, there is no reliance on textbooks, lectures, or videos. Have you seen this? When I first saw Sal Khan’s talk I was extremely excited by what he was saying. However when I went to his Khan Academy, I couldn’t believe how terrible the videos and problems were. It is all mindless and decontextualized. I think the idea is brilliant, but the execution is a disaster. I am not so concerned by how much fame and money he’s getting, but I am disappointed that such a good idea has so little substance to it. The research clearly shows that decontextualized math skills don’t transfer. Math skills without understanding don’t transfer. The key is to develop math skills in the context of doing something meaningful. For example, when learning fractions and ratios, why not do it in a cooking class where recipes have to be scaled all the time? The students will teach themselves ratios and fractions in no time at all. That is where something like Khan Academy (with much better execution) could be really beneficial. Khan did not start Khan Academy to become famous or to make money. He has recently received a lot of publicity and some money. If you follow the history of his project you’ll find that it has only really taken off in the latter part of 2010. His method can be criticized and pulled apart but look at the results – it works for many people around the world. His videos are of the most popular educational videos on YouTube, bad quality and all. In South Africa there are many schools that don’t even have a Maths teacher. The learners have to prepare for a Mathematics exam working on their own. Just imagine what a difference it could make to their lives to have access to the Khan Academy exercises and videos. Look at the bigger picture. Rather encourage a good effort and contribute to make it even better. Technology can be used to reached millions who would otherwise be left out in the cold. I know that Khan didn’t start KA to make money. He also wasn’t the first to put tutorial videos online. (But he is the most prolific.) Now with all the money, attention, everyone hanging on his every word, and a lot of US education “reformers” like Bill Gates backing him up, I think he has a great opportunity to do something really excellent for education that a lot of teachers in the classroom do not have the social influence to do. (Have you seen/heard what the US public and politicians think of teachers?) Like David Brookes said, this could be so much better. But right now the developers just seem to be tweaking the reward badge system, the profile reports, and type/style of exercises. No one at KA seems to be improving the pedagogy (like adding some kind of Socratic question/tutor system or changing the videos to be in line with Derek Muller’s research about the effectiveness of video lectures). And Khan Academy isn’t hiring teachers, either. So the best we can do is shout from the sidelines. “So the best we can do is shout from the sidelines” – but WHY? The best each of us can do is create our own OER materials, or remix other people’s materials. There is a natural tendency in social media (and of course broadcast media) to aggregate attention on a few people. Despite this tendency, there are thousands of OER content creators for mathematics (the field I know), and there are more appearing online every week. Let Khan do his thing, and do your own! There is power in aggregation, too. So the next best thing is to get together with like-minded people, create working collaborations and networks, and aggregate and structure content in these commons. Yes. You are right. In fact, a number of us have started the Global Physics Department. And a lot of great new physics teacher blogs have been cropping up (see my blogroll). I beg, borrow, and steal from these people. Plus, I am part of small group of Modeling Physics teachers who are trying to train more physics teachers and are trying to keep the pedagogy alive. I feel like all these awesome things are going on in isolated patches, just under the surface. It’s disheartening to see those in control push in one direction (testing, merit pay, etc. ), while we struggle to move in the other. I think the biggest celebrity we have is Dan Meyer, but I’d wager that the majority of math teachers do not know who he is. Wow, great groups!!! This is exactly what I meant – building communities and smart aggregation of content. Great idea, Maria. I’ll bring it up at our next meeting. Looking forward to working together! I too disagree that video based lesson is the way people can learn deeply. I hold the world view that people need to experience for themselves in order for contextual knowledge to take root. That is why I make physics sims like OSP n PheT types for students to experience for themselves. http://weelookang.blogspot.com has menu of sims I remixed from the OSPhyiscs community. Lookang, what a powerful collection! Open licensed, too – great. I think videos can accompany applets, just like you have text explanations to go with them. The text itself does not lead to deep learning, but it helps to work with the applet. Videos (e.g. screencasts made with Jing or something like it) can help in other ways – for example, showing an animation of an especially interesting combination of parameters. I have a difficulty with making videos in English, because of my strong accent, though. Students can do voice-overs. Wow, what a great post and some really interesting comments. 1. The issue of using online video lectures becomes more complex when we look at schools where there is a lack of Maths trained teachers (a situation more prevalent in Senior grades and High schools). In these circumstances, the Mathematics classes often fall in the hands of people who do not love Mathematics, or worse still, people who do not understand the relevance and applications of Mathematics in the world around them. The detrimental effect these people can have on the Mathematics learning of the students in their classes, cannot be underestimated. I can see how access to online ‘lectures’ can support the students to grasp the basics. However, the students will still miss out on making deep connections with the learning content, as it would have been delivered only via a video, and not developed while working on a problem or real life application. It seems a very superficial way to learn Mathematics. 2. Many millions of people around the world may be learning some aspects of Mathematics using these videos, but we need to remember that these people probably have some understanding of other Mathematics concepts, which then means that the videos are addressing some aspects in their overall learning where they may have missed some vital ‘steps’. These videos are not used in a vacuum by these people, but rather as a small part of their overall Mathematics learning. 3. Unfortunately, the structured curricula we have in many educational departments, does not allow teachers the time to let kids construct their own learning all the time. What is required of many teachers, is to gloss over the curriculum content and to hope that something sticks and clicks in the minds of their students. This does not promote deep understanding. If we take a leaf from the schools in Finland (these schools consistently rank in the top three in the world for Mathematics), it is clear that effective Mathematics learning occur where teachers have the time to allow kids to explore and experiment with the content. Perhaps a video may be great for an introduction or for revision, but the real life-long learning occurs when the kids are playing with and learning from their own applications of the content. I have to admit that my own Mathematics classes usually resembled the vibrant, noisy class of the second video. I was usually in there with the kids, gently guiding them to discover the concepts themselves. I think there is a place for the videos, but I would rather make my own videos so kids can hear the lesson in my voice…I would also use lots of real life applications in my examples. After the video, the kids will be given the open-ended explorations which will allow them to create and construct their understanding. I have not even touched on the importance of relationships between teachers and students. Thank you for this post, and for your thought-provoking comment on my blog http://marynabadenhorst.global2.vic.edu.au/2011/03/19/to-flip-or-not-to-flip/#comments. I see KA as a total game changer. Working through all of the problems and lessons for math on KA could be done in 1 or 2 years. With the right framework, students can be motivated to finish the activities and build the proper skills. With the skills in place then they can tackle the more difficult real life problems. This could be done in a standard class. The real power of KA is that it targets each student directly. In a regular class one student may be sleepy, another might not understand. At KA, these students get the help they need. For a certain exercise one student may have a problem adding the number 9, a different student a problem adding the number 7. KA targets this. We need to implement this type of skill building into schools. It raises the bar for everyone. Khan Academy itself is not going to teach “rich problem solving” with multiple answers, open-ended problems & solutions and that kind of stuff. However, it will make it much easier for students to master the basics so that they can engage in “rich problem solving”. Math cannot be used for rich problem solving until the basics are mastered. Not 70%, or 80%, but 100%. Our schools, education systems, and curricula are not set up to let most kids master math, and as a result, efforts to use math to solve real-life problems will fail. What Khan Academy does is create a real dependency graph of skills and pre-requisites. These aren’t coarse-grained by grade level, but are fine-grained and go by actual math concepts. If you master the basics, it makes advanced math easier to learn, and it makes math easier to use to solve real-world problems. With self-paced learning, rewind & repeat, exercises, and data gathering, teachers can focus their efforts on very specific learning problems and gain tremendous success. That will help more students understand the basics at a 100% level. Salman Khan himself sees his videos and software tools as something you do “in the morning” while you “build robots” in the afternoon. i.e. He believes in the value of solving real-world open-ended problems. I like to pose very open construction problems to my math clubs, such as, “Make a circle” or “Make a grid.” At first, students just make a rough sketch or a very approximate and primitive model of the object. But then, ah, they work on refining it, making it more precise, making it accurate, making it interesting and funky and weird. That’s where a lot of problem-solving happens, and a lot of basic skills are developed. Our current math education is woefully inadequate and failing the vast majority of our students and you criticize the free and excellent basic skills training that the Kahn academy provides. Can you do better? Advanced mathematics only for the elite is our current mantra. Sal Kahn asserts that math can be mastered by everyone. You should ask yourself why that might threaten you? I don’t like the idea of Khan academy because our school has turned it into a required summer project which is unfair because students can’t have fun like summer break is for. It is also very confusing to me since our school barely explained it. The website doesnt do much to teach us either. It can tell you the answer but won’t help much. Well that is just my opinion. The constructivist approach has strengths in that it helps with student motivation and engagement — and every mathematical formula was first imagined by somebody, so who’s to say a young person can’t do the same thing today? However, without proper guidance, and, to some extent, constraints, there is no guarantee that these methods will be effective, so in these cases the competency of the educator in constructivist theory is essential. However, it is ridiculous to frame it as though the ‘learn by drill’ approach is completely invalid. The constructivist movement is fairly new, so how did those constructivist subject area experts become knowledgeable in the first place if the rote methods of years past were so ineffective? Like one of the students in the Independent Project video, I was interested in videomaking as a teenager, and had dreams of film school. By time I was 17 and applying to college, though, I had decided that I wanted to study something more practical, so I chose Computer Science (which ended up qualifying me to teach math at my former teaching job, so you better believe it’s related!) Math is a part of an interdisciplinary education, and focusing on any one thing to the detriment of the others from too young an age can be limiting down the line. So I’m VERY glad I had teachers forcing me to learn all that math for those years when I was so focused on creative pursuits, because it ended up helping me a lot in my studies and my career. And although I don’t have much free time any more, I still get to do all the creative things I enjoy. In fact, with all this math and tech knowledge I may even give Mr. Khan a run for his money one day! Constructivism is a theory of how people learn. You can use constructivist theories to analyze any method or curriculum, including fact drills. Compare this to the theory of gravity vs. gravity itself. It takes a bit more theory to develop spaceships compared to horse-drawn carts, but the gravity’s been there all along, before its theory was described by humans. It’s not a replacement for teachers, classroom activities, or higher level hands-on learning. Not sure why everything in education has to be so black and white. My students have been ‘excited’, yes, actually ‘excited’ about doing math. They stay through lunch hours, enjoy the challenges of gaining points and it’s even become a social activity in our classrooms. I think that is a win. Combine that with rich learning opportunities and inquiry and kids will learn to love and be interested in Math. Khan is another tool that make for a more rounded learning environment. Um… I think you are grossly misunderstanding the Khan academy. I liked especially like your video when you said “But shouldn’t math classrooms sound like this?”– That is exactly what the Khan academy is doing. It is flipping the classroom. Students go home for the lecture, and when they get to class the teachers have even more time for creative work, or more targeted assistance. * “Khan and Gates are not talking about what students and teachers are doing beyond Khan Academy. The news stories are not showing the open-ended problems the kids should be engaging with after mastering the basics — instead they show kids sitting in front of laptops working drills and watching videos. The focus is on the wrong things — hence my statement that education needs changing because we are valuing the wrong things. Khan Academy is an excellent solution to the entirely wrong problem. Why isn’t anyone (besides Dan Meyer) talking about rich math and science education? For better education, consider this blog and the weblinks there. Pingback: sfjalar » Kahn Academy – ný leið til að kenna á gamlan máta? My point is simply this: as long as people continue to believe that ONE SIZE FITS ALL , that one kind of LEARNING EXPERIENCE fits all, then they are as doomed to failure as the last generation of educators who thought that they had “THE ANSWER”. If they succeed to install their prejudice in an educational system then once again we have reduced the intellectual ecology by selecting people who function well in that one learning mode, The real world problem is to find a way to route the correct learning resources = explanations, demonstrations, tools, individual and collaborative practice to students AT THE MOMENT and IN THE FORM they need it. In the age of progressively atomic resources applicable to every possible learning mode, the practical question is how to solve the MATCHING PROBLEM of needs to resources as efficiently as possible NOT to decide ONCE AGAIN that some particular mode is best. Finding a practical solution to this matching problem on a universal basis is the next step in education. Everything else is history repeating itself. @John Dell I think people are up in arms about this or that options because they don’t feel free to choose. I am saying this because people who ARE free to choose – such as math club leaders, or homeschoolers – are likely to shrug in the general direction of materials they don’t like, and move on to use materials that fit their needs. My daughter (unschooled all her life) used Khan videos a few times for one of the purposes you named: to look up “where the minus goes” in a particular procedure. She was helping me with curriculum writing and she needed to design some units about standard algorithms (which she does not use herself). I don’t remember her being bothered about Khan Academy (or Wikipedia, or Wolfram|Alpha, or Facebook friends etc.) not fulfilling the rest 99% of her math ed needs this year. I agree: “Don’t hate the player, hate the game.” Khan Academy is merely a player. We need to change the game. In urban ed, students passing the tests means they break the cycle of poverty they are in by getting into a good high-school, then good college, and having a good job. Khan is awesome in this scenario, because it helps them pass the test. What is a teacher to do in this case? I’m asking because I’m struggling with this right now. The most practical answer I have come up with is: I am to make it possible for kids to score well and in doing so, hope that perhaps, just maybe, whatever I did in the process of getting them to score well was interesting/thought provoking to them. In essence, I haven’t found a way to provide rich experience to kids while still helping them to pass the test (when they’re 4 grade levels behind). So I just help them pass the test in hopes of them breaking the cycle of poverty, and maybe their kids can go to schools where just passing the test isn’t good enough, schools like the one you teach at Frank. If someone has a solution/thought for this predicament of urban education + rich learning experiences + standardized testing, I’m all ears, because I haven’t come up with one yet. I’ll admit I’ve drank the Koolaid so to speak. And I DO think the methodology behind integrating technology, high quality presentation, knowledge maps, dynamic mastery practice, gamification among many other dimensions is quite simply awesome. To the people who say it doesn’t teach deep understanding and all the other negative commentary I’d say, perhaps the jury is still out (though the data indicates the jury is actually back with a verdict of WINNING). However the fact of the matter is for better or worse we DO live in a society where a person’s intellectual worth and opportunity is largely summed up in their SAT score. So at the very minimum this gives kids the opportunity to pave they way for their potential potential by understanding core concepts and achieving a level of mastery where they can rock their tests. I think we can all agree Dan Meyer is right, but I believe the Kahn Academy is a path to get students to where they can have the discussions Dan is talking about. The two are not opposed. They are complimentary. At best it really does change everything. You don’t want your children learn history just from Sal. Thanks. would have been a horror to me. It is so inefficient and boring. So my answer to this is clearly ‘NO’. If you maintain a hatered-filled blog like this, you really should have a dislike button. As ed. research clearly shows, listening to a lecture, a poor one (Khan) or a great one (Lewin from MIT) does not help much anyway. Yes, the KA videos have been viewed more times than some MIT OCW videos – but cats playing piano and girls falling off bikes still beat KA hands down…No studies have ever shown that KA is better than its absence. The “success stories” are just the stories of kids getting extra homework and the teachers and the KA reps making sure that the extra homework is done. Then the test performance – surprise! – goes up. Overall, I think the media fascination with KA stems from the fact that deep inside, people don’t realize that it takes a lot of education, knowledge and very specific skills to be an effective educator (or even an effective lecturer – which is much, much less than an educator). The journalists cheer Khan’s “challenge to the educational establishment.” I wonder if those journalists will have Khan perform a brain surgery on their children (you know, as a challenge to the “medical establishment” or take his legal advice, to stick it to the legal mafia) – probably not. But teaching, sure – anyone with an MIT degree can do that, right? Besides, if it is on a screen, it must be good, right? What can I say? each ed. fad, especially tech-ed fad, simply grows the digital divide (which later becomes an even greater economic divide). Which side will your children be on? The “learn from a screen” side or “work hard because there are no shortcuts” one? You decide. * KA could replace the other avenues of learning – I dont think any of the proponents are clamining this. KA is just an additional tool (a great one) and a framework that educators can use the best way they think it fits. The same framework can be used to introduce other ways of teaching mentioned here as well. Please go ahead – and the community will embrace them as well. Personally, I found the KA videos amazing in most cases – but there are some mediocre ones as well. My wife and I use them to update ourselves and of course to teach our 8 year old son as well. A great teacher will never be replaced by technology, but great teachers are rare. What happens when the school system doesn’t meet your needs? Kahn’s (and iTunes U, Open Courseware, etc.) are giving everyone everywhere the opportunity to learn- regardless of location, $$, time of day, gender, age, etc. We, as students, as parents and as teachers have choices (that threatening word!). We can learn at our own rate! No one can force us into a grade level, the latest educational trend, a prescribed rate of learning or into a school or classroom that’s not right for us or for our children. Not all of Kahn’s videos are great, but then again not all of my teachers or professors (inc. at MIT) always delivered an outstanding lesson or lecture. I look at these Internet educational sites as evolving opportunities. They are democratizing education. I think we teachers (including the great ones) are worried that overhyped KA will tempt the policymakers to use it as a cost-cutting measure on a huge scale. That’s why there is a hype – NOT because it’s better, but because it’s cheaper. I would also posit that, yes, not all teachers are great. However, a video (even a great one) can only replace a truly horrible teacher – even a mediocre one is better than a video. How many people have bought weight-loss videos? How many of those actually lost weight? How many got rich off that scheme? Think about it. Khan Academy is about reviewing the basic and learning things at your own pace. It is successful helping with the fundamentals. Also it is free. I think that the first thing we need to realize is that Khan Academy is a new concept in learning. It will take some time in order to truly measure its effectiveness, yet i think that it is a great idea if used the way that it was intended. Khan was never meant to replace teachers. On the contrary, the idea is to free up precious teacher student time. Imagine in a science class where kids are taught how airplanes work. Conventionally teachers will spend several lectures explaining the aerodynamics. Why not leave that for homework and actually try building a model plane in class? I believe that this is the kind of thing that Khan can open us up to. Of course there are still many kinks to be worked out. (Its a new concept remember) but i believe it is a step toward more effiecient and effective learning. – Khan realized that quantity is more important than quality: he singlehandedly produced hundreds of videos of very poor quality (I am talking about the pedagogy, not the production values), which enabled a lot of people to find “something” on the topic of interest. He also made sure that the videos were short – it helped, too. And he does have a soothing, non-shrill voice – it’s good, too. – Khan managed to interest Bill Gates, that big education expert who has no financial interest whatsoever to push computer/tablet-based way of learning, right? As for Dan, I wonder where in the world did he see a teacher who spent “several lectures explaining aerodynamics” in a K-12 science class? I challenge him to name even one teacher who did even one “lecture” on this. Aerodynamics is an exceedingly complex subject and nobody teachers it beyond “gravity, lift, drag” – and even that is not used at all in “building a model plane in class” – which a lot of teachers have been doing for decades without using KA whatsoever. So, yes, KA is just an additional (and pretty bad) tool in the teacher’s arsenal. There are many bad tools on the internet – and very few good/useful ones. The good ones tend to be produced, edited and piloted by groups of professionals, not by bored ex-quants… sorry, Sal. this guy is an idiot. khan academy is not a curriculum..its used to identify and fill achievement gaps in math education. It is remarkable how many people pass judgement on the Khan Academy as attempting to replace a rich learning environment when the idea has always been to use he videos as a resource outside of school so that the teacher has more time to teach instead of lecture. Think of the video as a textbook. When the teacher says “read chapter three before next class”, they are not suggesting that the students teach themselves using the textbook. They are using the textbook to give an introduction to the topic that they are going to unpick in the next lesson. In my personal experience, my mathematics class was mostly a lecture. The teacher talked too fast and there was no time to go back over things. We were given homework to put the concepts of the lecture into practice but I had no one at home to with my homework so my education suffered. If I had been given video lectures. To watch as many times as needed at home, and could get help on the “homework” work sheets in class, I would have excelled at school. Video lectures simply allow the teacher to teach rather than lecture and if the teacher wants to make their own video instead of using Khan Academy videos then more power to them. But if the Khan Academy video is good enough then why duplicate the work? Dear Frank, I agree with your comments and arguments about education. I believe in interactive learning and also I believe in the power of observation and learning through action, experience, exploring and group learning interactions. I don’t see how Khan academy can bring that rich experience where students get to explore, experiment and interact with their teachers, students and learn by doing rather than just listening to someone on the computer. I also believe that our conventional University degree can be shorten to 2 or even less years to complete Stem Programs. We need to explore why it takes four years to complete a degree, and why it takes 14 years or more to become a doctor. We pay our sports athletes millions but pay our doctors and teachers much less, but it takes them 4 to 14 years of schooling.